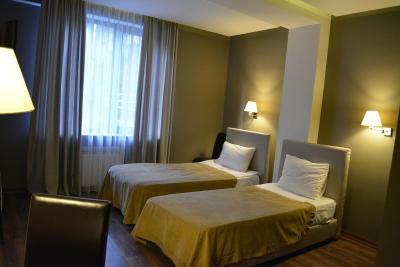 This hotel is located in the center of Tbilisi, a 10-minute walk from Rustaveli Metro Station. Free Wi-Fi and a 24-hour reception are featured at Kolkhi Hotel. The bright, air-conditioned rooms offer warm-colored interiors and classic-style décor. Each room comes complete a TV and a private bathroom. The on-site restaurant serves Georgian cuisine, and a variety of drinks is offered at the bar. 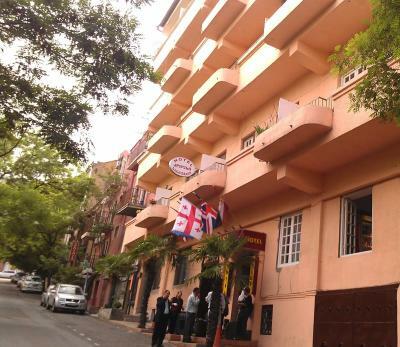 A variety of cafés and restaurants can be found within a 5-minute walk from the hotel. The lively Rustaveli Avenue is a 15-minute walk away. Tbilisi International Airport is 12 mi from Kolkhi Hotel. Air-conditioned room offers a TV and a private bathroom. Air-conditioned suite offers a flat-screen TV and a private bathroom. Features a bedroom, a living room and a balcony. All older children or adults are charged GEL 50 per person per night for extra beds.